SimpleTherapy offers live, on-demand coaching certified by orthopedics, surgeons, chiropractors, and behavioral therapists. Sign-up using your Insurance ID or Employee ID. Answer some questions about your pain and your goals. Sign up using our intelligent Texting Service right from your phone by sending a simple text message. It takes less than 2 mins to onboard. We take into account everything from your pain levels, range of motion, BMI, gender, areas of pain, and your schedule to create a plan that’s just right for you. Personalized based off your range of motion. Share you personal goals and track your progress toward them. You don’t even have to leave the house to relieve pain. Our certified trainers will show you how to do different exercise stretches during your session. You give feedback after every stretch and the following stretch is catered to your needs! You can skip exercises if they seem too hard or you don’t like them, and our intelligent system will adjust and give you an exercise that suits you. Our coaches are certified, trained and always use conservative measures so you stay safe and get the most pain relief out of each session. Thousands of members have completed our program. Our programs are split into 4 phases that are designed to relieve pain, restore flexibilty, and build your strength. Improving range of motion with the most basic and essential exercises. Improving body mechanics with strengthening exercises. Combining flexibility and strength to get you back in action. This phase helps you in maintaining all the progress you have managed to achieve by combining all the exercises and variations. 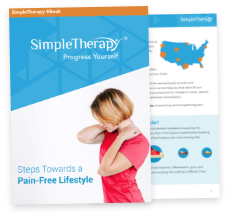 SimpleTherapy provides Webinars, Tips and Tricks, and E-Books to help you learn more about your pain. Your SimpleTherapy team is here for you! Hey there! Thanks for signing up for SimpleTherapy. If you have questions, feel free to ping us by clicking this icon anytime. We will check up regularly on your progress. You’ll get rewarded with badges and points for keeping up with the session, logging into SimpleTherapy and giving feedback! You can get rewarded for just exercising! Complete 5 sessions and get a month of SimpleTherapy free for a friend. Complete 18 and get 6 free months! SimpleTherapy will not only ease your pain, but also teach you have to make modifications in your everyday life to keep your pain away. The program is designed to motivate you and help you reach your goals and maintain your gains! Enjoy the things you love to do everyday, pain free. Relieve pain that’s cause by the repetition of your work environment. Be active and participate in activities that pain held you back from. Don’t let pain stop you from spending time with your friends and family. It’s time for a better tomorrow! Stretching everyday can help prevent pain, relieve pain and improve overall health. Feel better within 2 sessions! I’m ready to start a session!